We are a humble family, who fell in love with our first Labradoodle Kona , and decided to share his fantastic personality and amazing disposition with others. Kona is a 5th generation American Labradoodle with a tender and patient disposition, calm demeanor, and a most loving personality. He is very friendly and great with kids and other animals. Everyone who meets him (including those who don't like dogs) wants to take him home. He is so mellow, and calm, he changes peoples' minds about dogs! He follows me around the house, and is a loyal member of my family. He is eager to please, and was easy to train. He has changed colors from Chocolate to Cafe. This means he has soft, silvery chocolate coloring with varying shades of milk chocolate and silver throughout. He stands at 25 inches 60 lbs. He is proven with good sized litters in a rainbow of colors! He has fathered puppies in cream, dark and light brown, black, tuxedo, and parti! He is OFA Certified and health checked. Puppies are beautiful, black or champagne, Multi-Gen American Labradoodles. They will be standard size, averaging 55-65 lbs., hair and coat textures will be curly with no shedding. These pups that start out black can develop silver coloring over the first few years of their lives. Our puppies were born in the midst of family, children and company, which is a constant for us, and will be raised in our home, with kids and other dogs, held daily and are well loved and socialized. These puppies will be loyal and confident with an excellent disposition; perfect as a companion pet, therapy team, service or guide dog. The puppies begin their potty training, and exposure to the crate at 3 weeks! 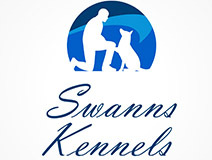 We welcome and encourage you to come and meet the parents and see how our pups are raised. However, I do not allow Visitors to handle the puppies until they are 6 weeks old. They are ready for their forever homes We are accepting $250 non-refundable deposit for your puppy reservation, remainder due when puppies are 6 weeks old. They will have dew-claws removed, first shots, de-wormed and vet checked. 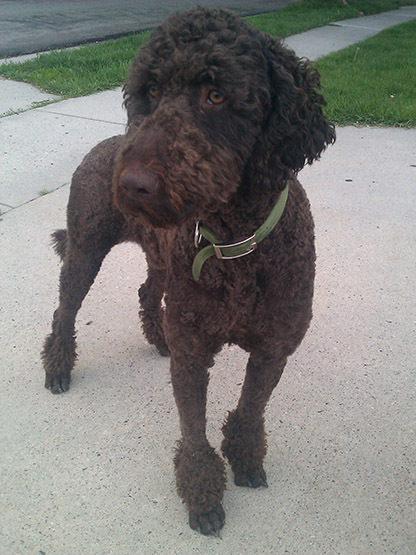 Mack Daddy is a Multi Gen American Labradoodle with a free spirit and a giant heart, he loves everyone! As a shining example of the loyalty and purpose of this breed, he spends his days following my 5 kids around, trying to involve himself in what they are doing. When we aren’t playing inside, we are on our bikes. He loves to run alongside my girls while they ride around the block, or up and down the street. We call them his bike runs, and he would do it all day if the kids could pedal that long! He will also play catch as a good substitute, and the chuck-it has become my friend. I think not only does he love the wind thru his ears; he loves to stretch out and run fast! 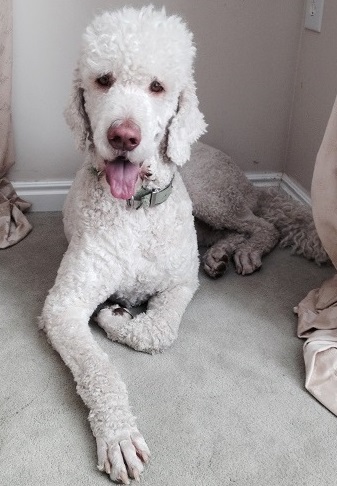 Mack Daddy is a beautiful white and buff Parti Labradoodle. He has the most beautiful curls imaginable, just perfect for his breed! He is a big boy at 70 lbs and stands at 27in. He is eager to please, wants to learn and ready for an important job! He is OFA Certified and health checked. Please call to make an appointment or ask questions , I am never too busy to talk about my puppies !